Like every adolescent, your teen craves independence. And now your teen wants the freedom to make purchases on a credit, debit, or prepaid card. Yikes! Since your teen’s frontal lobe isn’t fully developed yet, you’re understandably hesitant about this next step up in fiscal responsibility. How do you know your teen is ready? If we were talking about a youngster learning to ride a bike, the answer would be simple: start with training wheels. That’s how we avoid lots of nasty bumps, bruises, or far worse. When it comes to kids learning personal finance, where are the training wheels? If we just turn our kids loose on bank accounts and credit cards without some practice beforehand, they’re going to get hurt. In our teen’s case, the training wheels were accounts in our virtual family bank. It’s a way for kids to practice making real world spending, saving, and giving decisions while parents remain firmly in control of the actual purchasing. Here’s how a virtual account works in a nutshell. Suppose my son wants to buy something. He checks the current balance in his virtual spending account. If he has enough, he comes to his family banker — me — and either asks for a cash withdrawal (the ATM model) or asks me to make the purchase on his behalf. After I hand over the cash or make the purchase, I subtract the amount from his account balance accordingly. 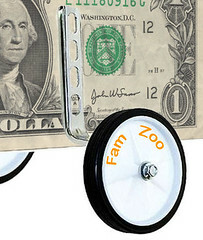 On the deposit side of the ledger, his account is credited each week when FamZoo automatically delivers his allowance. That’s the personal finance “training wheels” system we’ve used over the past several years to teach him how to manage his own money and spend within his means. So, now it’s time for the training wheels to come off. My son has proven he’s ready to start riding the purchasing bike without direct assistance. But, I’ll still be running alongside just in case. In other words, I want to retain visibility and some measure of control over his purchases. I also don’t want him to be able to spend more money than he actually has. And, lastly, as a teen, he’s not ready for a long term banking commitment yet — which is what signing up for a traditional checking account feels like. As a result, I’ve decided the right next step is a teen prepaid card. 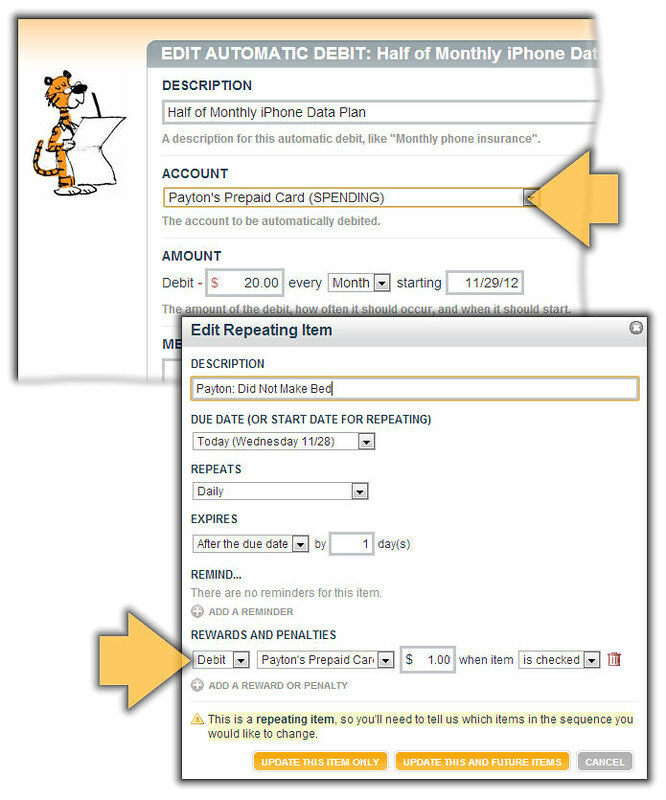 Here’s how we’ve made the transition from a virtual spending account to a prepaid card account. Step 1: Get prepaid cards for both of us. I want to minimize card loading fees and delays, and I know card-to-card transfers are typically free and immediate. So, I’ve decided to get prepaid cards for each of us. I’ll use mine as the “funding card” for my son’s card. I’ll load up my card every once in a while with relatively large sums of money. Then, I’ll periodically make “micro-transfers” to my son’s card for things like his modest weekly allowance, payments for odd jobs, and even “Bank of Dad“ interest payments to encourage good saving habits. Sometimes, the payments will actually flow in the opposite direction — from his card to mine — if he racks up a fine or reimburses me for a shared expense. In our case, we’re test driving the new FamZoo prepaid card integration that allows us to manage and monitor a “family pack” of prepaid cards together through the familiar FamZoo user interface. We can keep using all of the FamZoo conveniences like automated allowance delivery, interest payments, auto-debits, checklists, budgets, etc, while turning our son (semi) loose with his own prepaid card. To get started, as soon as we received our prepaid cards in the mail from our partner TransCard, we activated them online from within FamZoo. 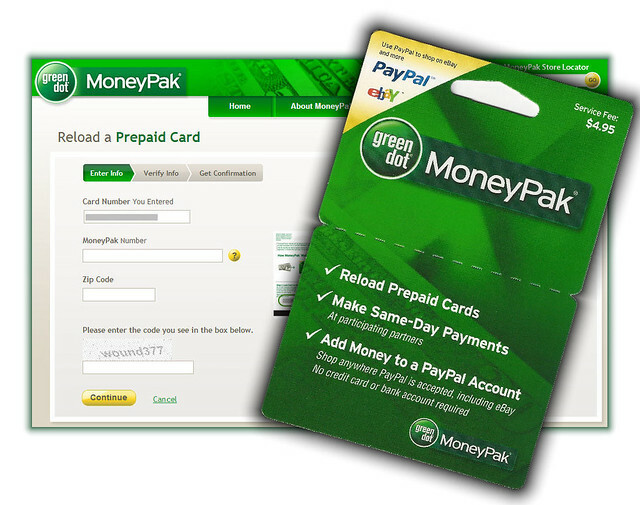 Note: we’re currently in private preview mode with our prepaid card family pack capability, and we’re shooting for making it generally available in early 2013. If you’d like us to email you as soon as it’s ready, just contact us on our site. UPDATE: FamZoo prepaid cards are now shipping. Find out how to order your family pack here. With our cards activated in FamZoo and the initial load completed, I can see the balances on all the cards in the family pack along with the transaction details for each. My son can sign into FamZoo separately and see the balance and transaction history for his own card right alongside the rest of his FamZoo accounts. Step 3: Roll my son’s virtual spending account over to his new prepaid card. Since I’ll no longer be making purchases on my son’s behalf, the next step is to move the amount currently in his virtual spending account over to his prepaid card. First, I’ll initiate a card-to-card transfer from my card to my son’s card that is equal to the current balance in his virtual spending account. Then, I’ll zero out his virtual spending account since we won’t be using it any more. With FamZoo, this was just a simple transfer action from my son’s virtual spending to his prepaid card. Behind the scenes, FamZoo performed the appropriate card-to-card transfer and debited the virtual account accordingly. Step 4: Redirect my son’s allowance to his prepaid card. I still want to split my son’s allowance between spending, saving, and giving, so I’ll just redirect the spending portion to go directly to his prepaid card by pulling that amount off my card and transferring it to his card each week. For now, I’ll keep his saving and giving as virtual accounts. I’ll transition those to the real world later when he heads off to college and opens bank accounts — just like we did for his older siblings. 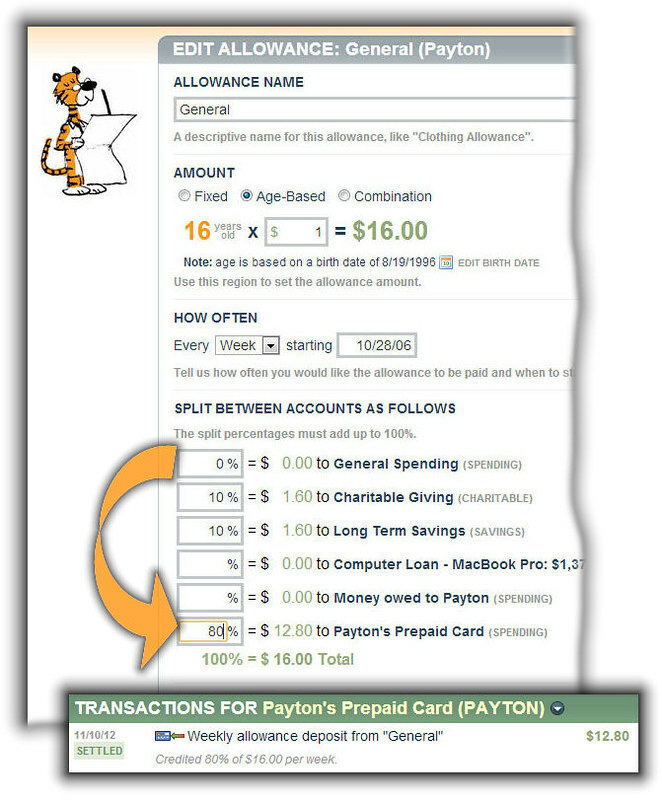 With FamZoo, I just edited my son’s allowance definition and switched the spending split over to to his prepaid card. Now FamZoo automatically delivers the spending portion of his regular allowance directly to his prepaid card by performing the appropriate card-to-card transfers in the background each week. Step 5: Redirect my son’s shared expenses to his prepaid card. I still want my son to pick up his portion of the fees for some shared services he enjoys — like the monthly data plan fee for his smart phone. Those regular deductions used to come out of his virtual spending account. Now, I’ll just take the amounts off his prepaid card instead and transfer them back to my “funding” card. With FamZoo, I just updated the account selected for each of his Auto Debits to be his new prepaid card account. Now, each time an auto-debit hits, FamZoo takes care of moving money off of his card and back onto my funding card. By the way, the same holds for the penalties we assess when my son blows off his expected chores, like making the bed. I just rewired each of the items on our “chore fail chart” to take money off his new prepaid card account instead of his old virtual spending account. With FamZoo, I just edited the optional savings interest rate settings on his prepaid card account. The payments are now made automatically each week using my prepaid card as the funding source. That’s it. The training wheels are off! 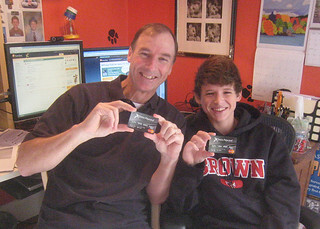 I have now transitioned my teen from a virtual spending account to his own prepaid card. Let’s hope he keeps his helmet on! P.S. If you want to reduce some clutter and hide the old virtual accounts (what we now call “IOU accounts”) from the normal view, see the instructions here. Love this! We just started using FamZoo 4 weeks ago and will appreciate this option in a few years. Our son is 12 and I like the training wheels approach to money management. Thanks Bill and Payton for being our guinea pigs! Thanks for the nice comments Kristin. We're really excited about how this is turning out. Payton likes the new found autonomy, and I like being closely in the loop. It's a neat intermediate step to a checking account and a debit/credit card - less of a commitment and more family/education focused. It may end up being a pretty good alternative for kids in college too. We'll see. Outsdanding! A little early for us (the oldest are 11 and 12) but it won't be long. We're loving FamZoo. Thanks for such a wonderful service! Varrin, thank you for the nice compliment on our service. Note that one way you can use the prepaid cards with younger kids is to have a card in your name that you use for spending on their behalf. They'll see their account(s) on their dashboard just as they do today, and you'll do the purchasing on their behalf, but the funds are no longer virtual and the transactions are all automatically captured (instead of having to be manually entered). Later when the child is 13+, you can get a card in their own name and put purchasing power directly in their hands. 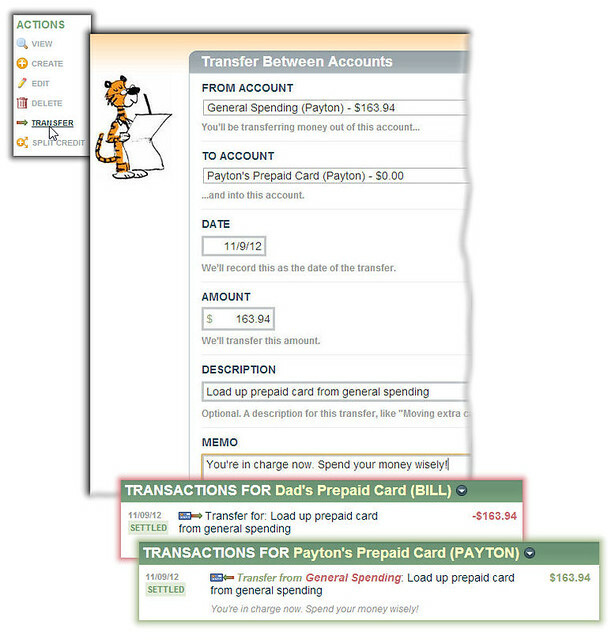 once you've transitioned to the prepaid cards, do you then delete the "general spending" child account(s)? or is there any reason to leave them intact? Excellent question. If you are not going to be using the IOU accounts (e.g., the old General Spending account any more) we recommend hiding them from the normal view instead of deleting them. That way, you still have the history around if you need to look something up or want to take a stroll down memory lane. This post shows how to hide (and unhide) accounts: http://blog.famzoo.com/2013/11/hide-old-virtual-family-bank-accounts.html Some folks like to use both an IOU account and a prepaid card account together. They continue delivering allowance or chore/job payments to the IOU account and just selectively transfer amounts to the prepaid card account when the child is ready to buy something. This approach can be a way to minimize the chance of an undesirable purchase and is useful for young kids in particular. What's Best, What's Next for Financial Literacy?